Scanning tunneling microscopy (STM)  is an outstanding tool for probing electronic structures and surface morphologies at the nanoscale. 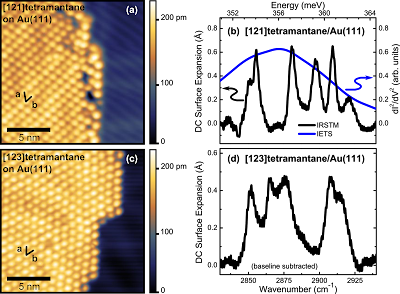 In a scanning tunneling microscope, a metallic tip moves above the surface in a raster-like manner and measures variations in the quantum mechanical tunneling current that exists in a nanometer-sized vacuum gap between the tip and the surface. These days STM is routinely used to explore metallic, semiconducting, and superconducting substrates, novel two-dimensional materials, as well as atomic and molecular adsorbates on these surfaces. While STM allows us to image surfaces with unparalleled atomic resolution, one significant drawback of STM is the lack of chemical contrast. For the purpose of chemical recognition, however, vibrational spectroscopy (specifically infrared spectroscopy) can be used because precise knowledge of molecular vibrational modes often leads to identification of the corresponding molecular structures. 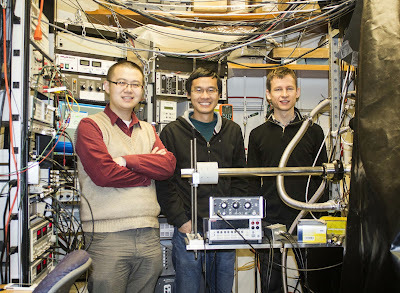 A significant breakthrough in probing molecular vibrations with STM was made in 1998 with the invention of STM-based inelastic electron-tunneling spectroscopy (STM-IETS) . However, STM-IETS has some disadvantages, such as its relatively poor spectral resolution which is dependent on temperature and bias modulation . Therefore, combining STM with infrared spectroscopy to probe molecular vibrations is still an extremely appealing idea, and a successful combination has so far eluded scientists. There have been a number of attempts to combine light and STM for many different purposes . However, in such studies, it is typically very difficult to separate useful information in measured signals from artifacts induced by the light heating up the tip. For example, one very common trick that is used to increase measurement sensitivity — light modulation in combination with phase-sensitive detection — does not work particularly well with STM since varying light intensity not only modulates the optical field at the junction but also modulates the tip-sample separation, and therefore the tunneling current. We realized that this problem can be bypassed if the laser light illumination is confined to a part of the surface away from the junction. The challenge, however, is to show that valuable information can still be obtained in this configuration. If so, all of the complex problems caused by the presence of light in the junction, such as tip thermal expansion, rectification and thermoelectric current generation , could be avoided. How can one still do optical spectroscopy with an STM without direct illumination of the junction? The main idea behind our new spectroscopy technique is to use an STM tip as an extremely sensitive detector that measures surface expansion in the direction perpendicular to the surface. As the light frequency is tuned to a particular molecular vibrational resonance, the molecules absorb more light. The absorbed energy dissipates into the substrate and leads to substrate expansion. This expansion results in an increased tunneling current since the tip-sample separation decreases. In the actual setup, a feedback control system is used to keep the tunneling current constant by moving the tip away from the surface when the surface expands, and we measure the distance by which the tip retracts. Accordingly, when the substrate contracts, the tip moves closer to the surface to maintain the tunneling current. Recorded traces of the tip motion plotted versus laser light frequency immediately yield molecular absorption spectra. Attempts to make similar measurements have been made previously  but the recent progress, including demonstration of high spectral sensitivity in our measurements, only recently became possible thanks to our advances in designing and building a state-of-the-art tunable infrared laser with a stable power output (shown in Figure 1) . Figure 1: IRSTM setup. An ultra-high vacuum chamber with a home-made STM is on the left and our home-made infrared laser based on an optic parametric oscillator is on the right. In order to demonstrate the performance of the technique, referred to as infrared scanning tunneling microscopy (IRSTM) , we prepared samples of two different isomers of tetramantane by depositing these molecules on a Au(111) surface. These molecules, with chemical formula C22H28, belong to a class of molecules called diamondoids (as their structures closely-resemble that of diamond) . When deposited on the gold surface, both isomers, tetramantane and tetramantane, form very similar single-layered close-packed assemblies as shown in Figure 2 (a, c). To obtain infrared spectra of these self-assembled structures, a beam of light from our tunable infrared laser was focused about 1 mm away from the tip-sample junction to a spot size of 1.2 mm in diameter. The spectra were recorded by tracing the motion of the tip while sweeping the laser frequency as described above. The measured IRSTM spectra for tetramantane and tetramantane are shown in Figure 2 (b, d). Several peaks corresponding to different modes of tetramantane CH-stretch vibrations are seen in the spectra and the spectra of the two isomers are clearly different. To compare with the STM-IETS technique, in Figure 2(b) the blue line shows an STM-IETS spectrum that has been previously obtained on a tetramantane molecule . In that work, STM-IETS resolution was not nearly enough to resolve any specific CH-stretch modes that exist in this frequency range. In contrast, Figure 2 demonstrates the remarkable chemical sensitivity of our new IRSTM technique. Figure 2: (a) STM image of tetramantane molecules on Au(111). (b) IRSTM spectrum (black line) of tetramantane on Au(111). The blue line (with a single broad peak) shows an STM-IETS spectrum of tetramantane on Au(111) from Ref. . (c) STM image of tetramantane molecules on Au(111). (d) IRSTM spectrum of tetramantane on Au(111). Vibrational peaks for tetramantane are seen to differ significantly from vibrational peaks for tetramantane. Vibrational spectra of molecules on surfaces can be used to study molecule-molecule and molecule-substrate interactions. Using IRSTM we have been able to observe the notable influence of molecule-molecule interactions between tetramantane molecules on their vibrational spectra. 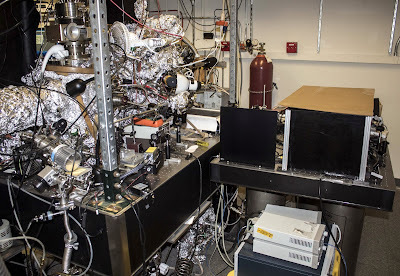 To investigate molecule-molecule and molecule-substrate interactions in detail, IRSTM measurements were also performed on monolayers formed by the simplest diamondoid molecule, which is called adamantane. These measurements were supported by first-principle calculations and new interesting insights have been reported in another recent study . While IRSTM allows atomic-scale imaging and the probing of vibrational modes of molecules in the same setup, the phenomenal spatial resolution inherent to conventional STM measurements cannot (yet) be attributed to the IRSTM vibrational spectra. The measured signal in IRSTM comes from excitations of all molecules that are illuminated by the laser beam, i.e. from roughly a trillion molecules in our measurements. Though extension of IRSTM to the single-molecule limit will not be trivial, and will require some bright ideas, there is a lot of room for improvement in the current technique. In addition, the indirect measurement of absorbed heat in a scanning probe microscopy setup could be applied to a number of other important technological applications. Gerd Binnig and Heinrich Rohrer, “Scanning tunneling microscopy — from birth to adolescence”, Reviews of Modern Physics, 59, 615 (1987). Abstract. B. C. Stipe, M. A. Rezaei, W. Ho, “Single-Molecule Vibrational Spectroscopy and Microscopy”, Science, 280, 1732 (1998). Abstract. L. J. Lauhon and W. Ho, “Effects of temperature and other experimental variables on single molecule vibrational spectroscopy with the scanning tunneling microscope”, Review of Scientific Instruments, 72, 216 (2001). Abstract. Stefan Grafström, “Photoassisted scanning tunneling microscopy”, Journal of Applied Physics, 91, 1717 (2002). Abstract. M. Völcker, W. Krieger, T. Suzuki, and H. Walther, “Laser‐assisted scanning tunneling microscopy”, Journal of Vacuum Science & Technology, B 9, 541 (1991). Abstract. D. A. Smith and R. W. Owens, “Laser-assisted scanning tunnelling microscope detection of a molecular adsorbate”, Applied Physics Letters, 76, 3825 (2000). Abstract. Xiaoping Hong, Xinglai Shen, Mali Gong, Feng Wang, “Broadly tunable mode-hop-free mid-infrared light source with MgO:PPLN continuous-wave optical parametric oscillator”, Optics Letters, 37, 4982 (2012). Abstract. 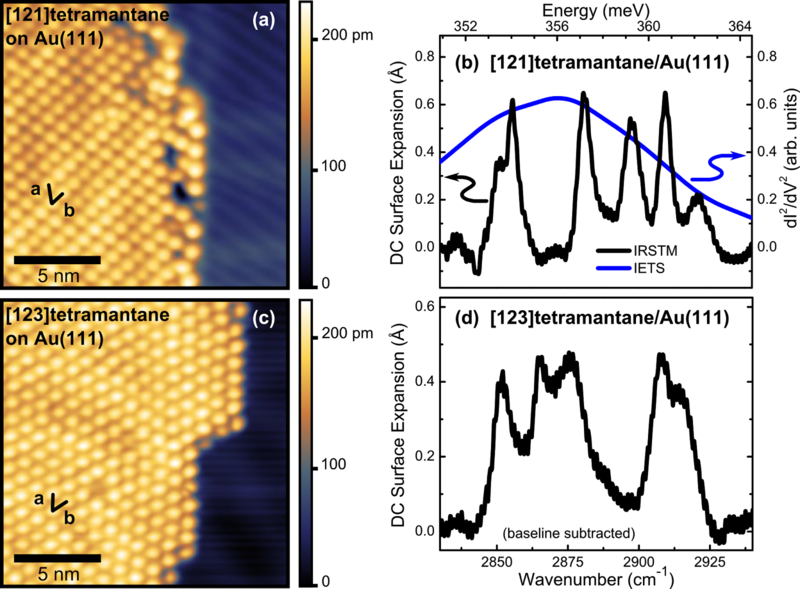 Ivan V. Pechenezhskiy, Xiaoping Hong, Giang D. Nguyen, Jeremy E. P. Dahl, Robert M. K. Carlson, Feng Wang, Michael F. Crommie, “Infrared Spectroscopy of Molecular Submonolayers on Surfaces by Infrared Scanning Tunneling Microscopy: Tetramantane on Au(111)”, Physical Review Letters, 111, 126101 (2013). Abstract. J. E. Dahl, S. G. Liu, and R. M. K. Carlson, “Isolation and Structure of Higher Diamondoids, Nanometer-Sized Diamond Molecules”, Science, 299, 96 (2003). Abstract. 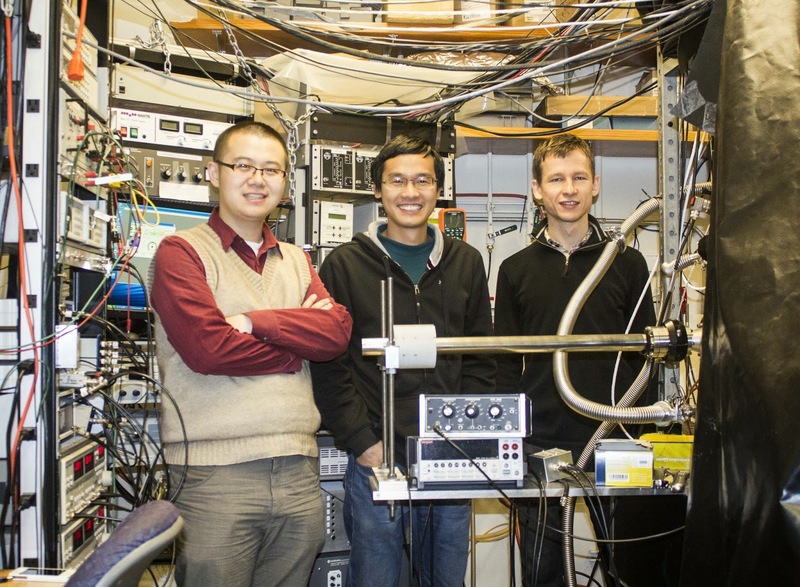 Yayu Wang, Emmanouil Kioupakis, Xinghua Lu, Daniel Wegner, Ryan Yamachika, Jeremy E. Dahl, Robert M. K. Carlson, Steven G. Louie, Michael F. Crommie, “Spatially resolved electronic and vibronic properties of single diamondoid molecules”, Nature Materials, 7, 38 (2008). Abstract. Yuki Sakai, Giang D. Nguyen, Rodrigo B. Capaz, Sinisa Coh, Ivan V. Pechenezhskiy, Xiaoping Hong, Feng Wang, Michael F. Crommie, Susumu Saito, Steven G. Louie, Marvin L. Cohen, “Intermolecular interactions and substrate effects for an adamantane monolayer on the Au(111) surface”, arXiv:1309.5090.